Provide comfort for the family of Karl Schnepf with a meaningful gesture of sympathy. Karl “Dutch” Schnepf, 83, of Le Mars, Iowa passed away on Wednesday, March 6, 2019 at the Brentwood Good Samaritan Village in Le Mars following a brave battle with COPD. Mass of Christian Burial will take place at 10:30 a.m. on Monday, March 11, 2019 at All Saints Catholic Parish – St. Joseph Catholic Church in Le Mars. Father Bruce Lawler will celebrate Mass. Burial will follow at Calvary Cemetery in Le Mars with military honors conducted by Wasmer Post #241 of the American Legion. Visitation will begin at 2:00 p.m. on Sunday, March 10, 2019 at the Mauer – Johnson Funeral Home in Le Mars. The family will be present from 5-7 p.m. with a scripture service at 7:00 p.m. There will also be one hour of visitation at the church prior to Mass on Monday. Karl John Schnepf was born on June 23, 1935 in Le Mars, Iowa, the son of George and Elvira (Alesch) Schnepf. 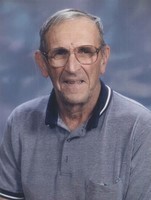 He was a 1953 graduate of St. Joseph’s Catholic School in Le Mars. Karl married Joan Wheeler on September 5, 1959. He farmed and was a supervisor at Harker’s Meats for 25 years. After retirement, he drove a school bus for Le Mars Community Schools for 12 years. Karl often referred to driving the bus as the “best job ever”. He served with Company K, Iowa National Guard for 7 years, leaving as Supply Sergeant for the company. Karl was a devoted husband and father. His family recalls his love of gardening, fishing, taking pleasure in driving the school bus, interest in world affairs, and hosting the many Japanese students. Karl was an avid Iowa State Cyclone and took great pride in seeing his four children graduate from Iowa State University. He loved music and enjoyed listening to his daughter Julie sing as well as his singing in the choirs at St. James and St. Joseph Churches for over 40 years. Karl was also the father of three Eagle Scouts. Grateful to have shared his life is his wife of 59 years, Joan of Le Mars, IA; four children and their spouses and families, Chris and Ana Schnepf, Leo, Maria and Sofi of Coeur d’ Alene, ID, George and Nancy Schnepf, Carly, Alec, Josh and Matt of Sartell, MN, Joe and Maggie Schnepf, Georgia and Jack of Seattle, WA and Julie and Joe Hlas, Liz, Michael and William of Sioux City, IA; sisters-in-law, Dixie Engel of Le Mars, IA and Maxine Schnepf of Omaha, NE; and many nieces and nephews. He was preceded in death by his parents; sisters, Georgia Schnepf, Margaret Flinn and Paula Uhrig; a brother, John Schnepf; brothers-in-law, Bill Engel, Larry Flinn, Dr. Robert Uhrig; and his father-in-law and mother-in-law, Jess and Laura Wheeler. Memorials in Dutch’s name may be directed to Hospice of Siouxland or All Saints Catholic Parish. To send flowers in memory of Karl John "Dutch" Schnepf, please visit our Heartfelt Sympathies Store. The family will be present from 5-7 p.m. with a scripture service at 7:00 p.m. There will also be one hour of visitation at the church prior to Mass on Monday. Military honors will be conducted by Wasmer Post #241 of the American Legion. We encourage you to share your most beloved memories of Karl here, so that the family and other loved ones can always see it. You can upload cherished photographs, or share your favorite stories, and can even comment on those shared by others. Milt Nussbaum, Lori, Bob and Emily Spink, and others have sent flowers to the family of Karl John "Dutch" Schnepf. Joanie, family and friends, my condolences. Milt Nussbaum purchased flowers for the family of Karl Schnepf. Dutch and Joanie were two of the most faithful members of the St. James Church choir during my years as the choir director. Even when it became difficult for him to make the journey up the steps to the choir loft, he continued his faithful attendance. He was a great addition to the bass section of the choir. His steadfastness and good humor will be sorely missed. My sympathies and prayers are with Joanie and his family.